…as usual the materials used by Salomon are of the highest quality. The attention to detail appears to be there. It’s got some nice stretch to it and the open mesh construction looks great. Weight-wise it feels spot on. OK, so how does it perform? Presenting The (updated for 2017) Salomon Advanced Skin 5 Set Pack. What’s good: the new, differentiating, or simply well designed or built features or aspects of the product. What’s decent: the features or aspects that are OK but not particularly new or differentiating. What could be improved: tweaks or improvements that could be made to make the product better. When to use it: the situations or scenarios where the product excels. How it compares: my current go-to competing products and how this compares. What’s good about the Salomon Advanced Skin 5 Set pack? The fit. It’s the best fitting vest, with sufficient storage for big days in the mountains, I have worn to-date given how high up it rides and how stretchy the fabric is – it’s just a really dialed in fit. It comes in four, unisex sizes ranging from a 27” to a 49” chest size. Awesome updates. If you used a previous version of the Salomon Advanced Skin 5 Set Pack, or an earlier 12L version, the 2017 version includes a few great updates. This includes larger front dump pockets and bungee cords to hold the soft flasks up even when they are empty. 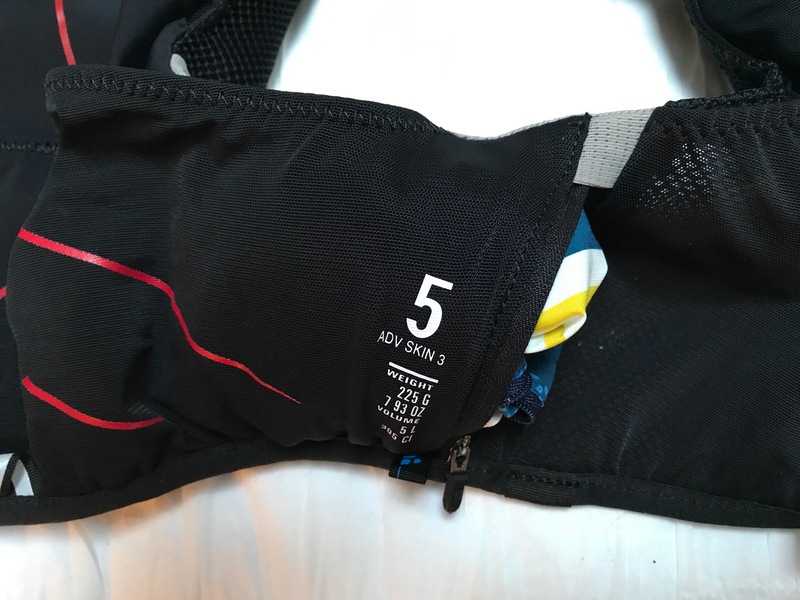 Like the lighter-weight S-Lab vests from last year and this year the Advanced Skin 5 Set includes updated front ‘dump’ pockets with plenty of front access capacity. The soft flask pockets now have stitched in bungee cords to keep the included 500ml soft flasks from falling down. I know, I’m a broken record but I really prefer products that are not overbuilt and this race vest includes all the things you need and nothing extra. Also, while it’s tough to tell from the pictures the back of the vest actually has four pockets. Two larger full rear storage option for a bladder or plenty of clothes, a tiered pocket in between these two that allows for a bit more organization, and a lower kangaroo pouch on the bottom that can be accessed without taking the vest off. The back of the vest is streamlined so it fits close to the body. Tiered rear pockets allow for plenty of storage that stays close to the body to minimize bounce. Salomon advertises up to a 1.5L bladder works with this pack but I managed to squeeze in a 2L bladder with no issues. Front access. From the front you can access any of the pockets on each shoulder strap, of which there are three on each side, either of the side pockets, the kangaroo pocket on the back, and pull an article of clothing out of the top of one of the back pockets – perfect. Plenty of front access storage on each shoulder strap. Secure, side zippered pockets are accessible while wearing the vest as well. Durability for the weight. The attention to detail on Salomon products is usually top notch and the Advanced Skin 5 Set Pack is no exception. I have no worries about the durability of this vest assuming you keep it away from sharp objects. The 4D pole loading system lives on. The value. The MSRP on the Salomon Advanced Skin 5 Set vest is $155.00. Considering the fit, high quality materials, storage, etc. I think it’s a solid value compared to its competitors. The included soft flasks. While the two included 500ml soft flasks do not leak, they have a small opening making it nearly impossible to load up with ice cubes. The included soft flasks are comfortably soft without friction points and well-made but I wish they had a larger opening to more easily accommodate drink mixes and ice cubes. The sternum strap hook attachment points. I believe the way the sternum straps connect on one side has been updated for 2017. While minimal and intuitive to use good luck fumbling with these hooks with cold hands or when wearing gloves. Thankfully, you shouldn’t have to take the vest off too often I hope given how accessible everything is as discussed previously. The sternum straps are challenging to hook and lock with cold hands or with gloves on. Anytime you want or need to wear a running pack. It’s a versatile pack that is minimal enough to only carry soft flasks or load up for big days in the mountains. The Salomon Advanced Skin 5 Set Pack is a do it all type of vest. Nathan VaporKrar 4L (review here). This is probably the most direct comparison. I’ll spare the details and say that the Salomon Advanced Skin 5 Set Pack is a clear winner in this head-to-head battle. Salomon S-Lab Sense Ultra Packs (either last year’s version or the Ultra 5 or Ultra 8 this year). The S-Lab packs are much lighter and cost less but bounce more when loaded up I experienced. I’m giving the nod to the Advanced Skin 5 Set Pack unless you don’t plan to carry water. If you don’t use a vest to carry water I would choose the Ultra 5 or Ultra 8. Ultimate Direction SJ Ultra Vest 3.0. The UD Jurek vest has more capacity, is lighter, breathes equally well, has a front pole storage option, and costs $25 less. What it doesn’t have is as much storage accessibility while wearing it as the Salomon Advanced Skin 5 Set Pack. Tough call but I prefer the fit of the Salomon. UltrAspire Spry 2.0. I’m guessing this vest flies under the radar and I’m not sure why. It’s a great option when you need just a bit more storage than shorts or a waist belt can provide. It has an elastic sternum strap that really expands, breathes really well, and fits great. Plus, it retails for $70 – what a value! I wore this vest last year at the Flagstaff Skyrace and loved it. It has less storage than the Salomon Advanced Skin 5 Set Pack but it also bounces more when loaded up. It’s a bit of an unfair head-to-head comparison as I see them as having different use cases. However, if I am forced to only have one vest I would choose the Salomon Advanced Skin 5 Set Pack. So, the $155 question – should you purchase the Salomon Advanced Skin 5 Set Pack? Questions, comments, or feedback on this pack? Please share! And thanks for reading! If you’re interested in purchasing this pack, please first check availability at your local, independently owned running specialty store. They need your business and are a great resource for the community. Disclaimer: This pack was provided to URP/Ben for testing purposes. All words and thoughts are ours and no compensation was offered or received. 40 Responses to "Salomon Advanced Skin 5 Set Pack Review"
Thanks for a great review! I have been wanting one for a while now. Getting one now! I do a few OCR’s a year with my regular hydration back and they are so bulky and annoying because they move around a lot during running. So the 2L bladder fit ok? I have two of those and didn’t want to have to buy a 1.5L. Where I am in Canada they do not seem to stock these vests so I’ll be buying it online. I tried a 2L Camelbak bladder and it worked. I don’t think you can fill it totally full but just a bit under 2L and hopefully it works for you. I just love the fit. On the bottle front, if you prefer hard bottles then 500ml Powerade bottles are a perfect fit and easy to remove/replace. Do you know if the 600ml soft flask that comes with the new Sense Ultra 8 fits? I just tried the new Hydrapak 600ml ‘Ultraflask XL’ and it fits. It’s a bit of a pain to make it fit, and I wouldn’t recommend it for races where you would be exchanging the flasks often, but it does work. From what I’m seeing in the Sense Ultra 8 vests those come with the 500ml ‘speed’ soft flasks, right? If the 600ml soft flasks you refer to are also made by Hydrapak, which I assume they are, they should work it appears. I have this vest and hated the bottles that came with it. I found that Salomon makes a “fast” or “speed” 500ml bottle with a larger opening ( for ice or elecrolyte mix) and the bottom of those is done and semirigid which makes getting them in the vest when not completely full a lot easier. I think Salomon should ditch the current bottles and upgrade. Thanks Justin. I was wondering if the ‘speed’ flasks were too tall or not. Good to know they also work! Thanks for another killer review Ben. I think that you would be able to switch out for the CamelBak 500ml soft flasks that have a wider opening to allow ice cubes in. Looks like a great pack–will be purchasing soon. Hi Tim. I checked the updated link Eric created in the ‘Purchasing Information’ at the bottom and it looks right to me. Am I missing something? Yes, the purchase link is correct. I didn’t notice that the first time. However, the product link at the top is to the old “s-lab” version. That’s what I was referring to. Thanks for the awesome review! Just bought this pack and find it almost impossible to get the water bottles back in!! Anyone else have the same problem or have a just received a pack that’s got a stiching fault. Ha, yeah Jason. I suspect I know what you mean. My buddy comlained about the same thing with the 12L vest when trying it for the first time. If you try to simply ‘push’ the soft flasks back down it will be a pain in the arse. However, if you use one hand to stretch the pocket, then kind of jiggle the bottle down by using gravity, shaking, and pulling ‘up’ on the vest (if that makes sense) – the bottle should slide down fairly easily. It may take a little practice to figure this out, and I can’t find a video demonstrating this, but hopefully by playing around with this you can figure it out and it will become instinctive quickly. I bought the M/L size and find it pretty tight. I don’t think it will be an issue, but I am a bit surprised as I followed their sizing guide. Does it loosen overtime? I am going to be buying this vest and can’t decide between the 5L or 12L. Should I just go with the 12L if I am on the fence? If the back of the 12L is not loaded up is there a big difference between it and the 5L? I really feel like I will only use the extra space about 10% of the time. Any help deciding would be appreciated. Thanks. Tough call Joe but if it were me, in this scenario, I would probably go with the 5L. Reason being is that I like a more streamlned fit and smaller footprint on my body to minimize any extra thermal layer. I run hot so the less on my body the better. For this reason I’m really loving the Naked Running band with the Katadyn BeFree filter/flask. This single flask/filter combined with as much food as I want to carry allows me to go really long in the mountains anywhere there is any kind of water source. It’s pretty rad and the best setup I have found so far all things considered. My next best setup is to use the Salomon 5L vest if I need to carry some extra clothes and a bit more water and possibly poles. Hi, so do I understand correctly, are people saying the bottles are a real hassle to get in and out when full? If I’m carrying extra water for a mate and want to get the whole bottle out to give to him, is that really hard to do? I was thinking of getting one of these packs to be a support runner for a challenge run a friend is doing… but if I can’t get the bottles out that’s a bit of a deal breaker. Shame as the vest sounds fab otherwise. Anyone got any experience of this? Would any other kind of bottle work better? Thanks! The soft flasks are certainly a tight fit but once you get the hang of how to remove and replace them it’s not too bad. What usually happens for me is the ‘dump pockets’ catch at the bottom and I need to pull that elastic bit of the dump pockets out to allow the flask pocket to work. If that makes sense. And these flask pockets don’t work well by trying to push the flask down in. Instead, get the flask started and then open up the pocket on both sides with your hands and let gravity and friction do the work. There is an art to it but once it becomes second nature it’s pretty fast. I’m curious to know where everyone puts their phone if they have this 5L – especially if you have a larger phone (Galaxy S5,6,7; iPhone 7, etc). I found that the side zip pockets are too short to fit the phone either vertically or horizontally, so I’m left sticking it in the kangaroo pouch and fishing around for it later, or sticking it in the front dump pouch in front of the flasks, where it has to be at just the right angle to not interfere with my arm swing. 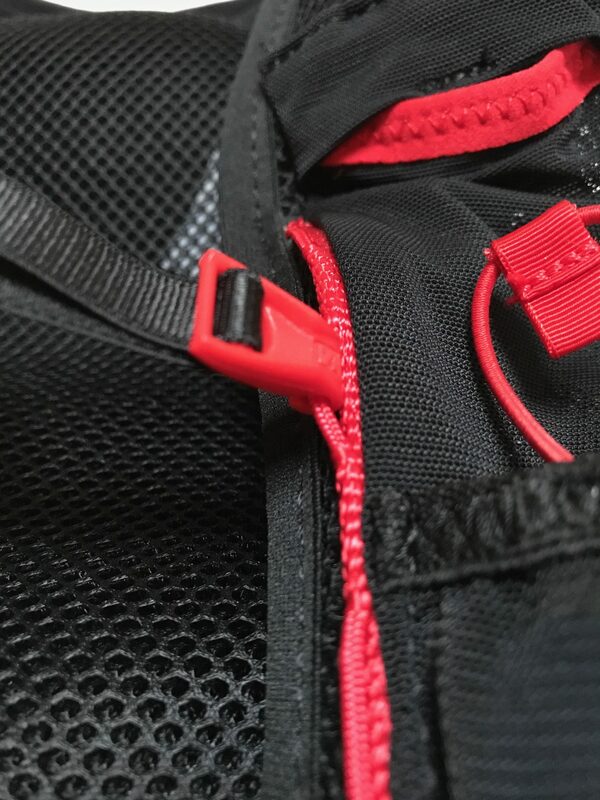 Saying that, if you do want to increase capacity a little bit, the 5 has lash points on the back where you can put some elastic bungee cord to hold an extra top, etc. I bought a pair of Nathan Lock Laces (about 7 quid on Amazon depending which of the zany colours you prefer) — meant for shoes but are just the job! They are the perfect length, come with a convenient toggle, and if you get reflective ones, add a little more visibility… thread them through and it works a treat. I would like to order this product online but I am wondering about the sizes. I am 6’1 and 155lbs. I am hesitating between the XS/S and the M/L. Anyone could help me with that please? Just got this 5L vest in a M/L and have to exchange it for a XL. I’m 175 lbs at 5’9″ with a 42 inch chest. The zippered side pockets barely fit my iPhone 6, so anything bigger will not work. I hope the elastic to the soft flask entrance stretches some, because it’s very tight. Other than that, I’m replacing the one from a few years ago, 2014 I think, which I really enjoyed over the years. Great detailed review..Question though: I have now tried both the sizes on XL and the M/L Advanced Skin 5l .The medium feels very tight to me and the XL feels too lose.Any advice ? Im 5.11 39in chest 164 lbs.Thanks all. For a person with 180cm and 60kilograms, will be ok the vest XS/S? Thank You! Before buying, I would highly recommend taking an opportunity to test out whether you have the magic touch with the soft flask openings on this vest. How to choose the right size? I am 180cm tall, chest 90, i went for a ML size but i have a doubt Xl should have be better? I am 183cm with 97cm chest and I went with the ML size. I thought it was too small, and I ordered an XL one. Before the XL arrived, though, I found how to wear the ML, and it is fantastic (I use it almost every weekend, have been doing so for 10 months!). The Xl is a bit looser where it meets the top of your shoulder, but not around the chest, where i felt discomfort when first using the ML. It took me some time to find the right carrying position, and I think I finally found the trick the day I pulled the back side as low on my back as possible. Give it some time, you’ll definitely love it! Greetings, does anybody else have issues with the noise when running? I have of course sucked all of the air out of the bladder, but still that volume of water moving up and down makes a fair sound. Maybe I am missing something else. Thanks.